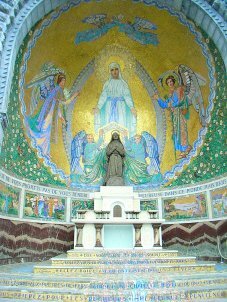 Lourdes apparitions of Our Lady began 150 years ago, when a 14-year old peasant girl from Lourdes called Bernadette, was visited 18 times by the Blessed Virgin Mary. Bernadette told her mother about the enchanted first vision and how wonderful it was to such a beautiful lady. Bernadette's Mother questioned her in disbelief, Bernadette answered her mothers question by saying I have seen a "lady" in the cave of Massabielle. (The cave of Massabielle was a disused ground, used for dumping contaminated material from the Hospital). The day Bernadette saw the Virgin Mary for the first time was on the 11 February 1858, while gathering firewood with her sister and friend. This was Bernadette's first apparition. On realizing that she alone had seen the apparition, and not her sister or friend, she asked them not to tell a soul what she had seen. Toinette, was unable to keep a secret, and told their mother Louise Soubirous. Bernadette mother questioned her and forbid her to return to the Grotto again. The second apparition that took place in Lourdes is one of the most difficult to reconstruct, because the events that took place were in fact not easy to place in their exact order. The second time Bernadette went to the grotto (forbidden at first by her mother) was Sunday. After High Mass, her sister and friend asked Bernadette's mother again and she gave me permission to go. The apparition took place between midday and two o'clock. Bernadette asked the lady to remain if she came from God and sprinkled holy water on her, she collected the holy water from the parish, the lady replied with a smile. Bernadette was immobile, and her eyes fixed on the grotto started to say her rosary. Due to Bernadette being immobile she was carried back to the mill where she regained full consciousness, and was scorned by her mother "NEVER TO RETURN AGAIN"
Bernadette did not return to the grotto on the 15,16 and 17th their for no apparitions happened. For the first time on the 18th of February the lady spoke to Bernadette. Bernadette took to the grotto her paper and pen and asked the Lady " what is your name and what is it that you wish from me" the lady smiled and said "it is not necessary for you to write what down what I have to say", but asked Bernadette for a favor "would you please return for the next 15 days". Bernadette agreed. The Lady also told Bernadette "that she could not promise to make me happy in this world, but in the next." The 4th apparition happened in the early hours of Friday morning. Bernadette goes along to the grotto with her mother Aunt Bernarde and 10 other people all holding a candle for protection. Bernadette said that the lady asked her to leave her candle at the grotto. She said "It my aunts I'll will ask her, and if she say yes, I will." on the 5th apparition thirty people were present, the news of Bernadette and the apparition was traveling around the village and other towns and people came out of curiosity. Bernadette later said that the lady had learned her a new prayer, which she said recited every day of her life, the prayer was never repeated or wrote down to anyone. The lady speaks with Bernadette entrusting her with a message, asking prayers for penitence, over 200-300 people were present. The lady said Pray to God for sinners. Kiss the earth as a sign of penitence for sinners!" The lady also told Bernadette to eat the grass growing below the grotto. From that moment every time Bernadette visited grotto she repeated the same act. 300 people present at the grotto despite the weather being cold. The Lady told Bernadette that she should go and drink at the grotto and wash her self their. Seeing no water Bernadette was confused and therefore went to drink at the Gave. The lady called her back and pointed at a spot just below the grotto to the left. Bernadette started digging with her hands and eating the herbs, she then uncovered a puddle of muddy water. Bernadette obeyed the Lady and carried on scratching the ground until she was able to drink some of the water, after the fourth time of disregarding the muddy water. When the apparition finished Bernadette said later "I do not know why the lady disappeared" and she went home. Bernadette was interrogated again. The spring began to flow a day later. Over 1,500 people were present. It is the second Sunday in lent, after mass an unpleasant surprise awaited Bernadette, she was questioned by Judge Ribes the 3rd interrogation to commence. Bernadette was banned once again from the grotto and she relayed " i will never give up. There were more than 1450 people present. Catherine Latapie claimed that she immersed her baby in the spring water at the grotto. Catherine Latapie baby had a paralyzed arm, miraculously he regained full movement. This was the first of the recognized cure to take place in Lourdes. The Madonna spoke to Bernadette and commanded her to "Go, tell the priests to come here in procession and tell them to build a chapel here." Bernadette went straight to to ask Fr. Peyramale which this wonderful new, Fr. Peyramale called Bernadette a liar and told her she must never return to the grotto, then he told her to leave. Bernadette was did not give up home and returned once again with one of the priests friends and repeated what the lady had told her, "Go, tell the priests to come here in procession and tell them to build a chapel here." Fr. Peyramale says "a chapel! a procession! poor child this is all what your stories needed" then in a sharp tone he says" ask this lady her name and when we know it we will build a sanctuary"
Bernadette asked the lady for her name, the lady smiled. Eight thousand people turned up for the 15th apparition. for the 3rd time Bernadette went to see M. le Curé, to tell him what the Lady had ordered "Go, tell the priests to come here in procession and tell them to build a chapel here." M. le Curé looked at Bernadette for a moment, and said to her, 'Who is this lady?' Bernadette did not know who this Lady was. The commissioned ordered Bernadette to find out this Lady's name and only to return with an answer. Bernadette asked the lady for her name again, the lady smiled once more. On the 16th Bernadette announced the lady name 'Je suis l'Immaculée conception' I am the Immaculate Conception. Bernadette said "I went every i went for a fortnight, and every day I asked the lady who she was, but these questions only made her smile". The last apparition was never mentioned by Bernadette when making her depositions. The grotto was still barricaded by the prefectorial-municipal ordance. Bernadette taker another road to enter the grotto from the other side of the river. In front of the baricaded grotto is a privet property. kneeing outside the fence by the riverbank Bernadette said "I thought I was at the Grotto, like I saw the other times. All I saw was Our Lady , She was more beautiful than ever." the immaculate conception said noting and Bernadette never saw her again.